When you are looking for a versatile grill that makes grilling a pleasure, look no further than Kamado Joe grills. Kamado Joe grills are the Rolls Royce of grills. These grills are one of the most innovative grills you will find in the market. Here at Wharfe Valley Stoves, we take great pride in making available to our customers some of the best products in the market. When you are looking for the best grilling experience, look no further than Kamado Joe Grills. And when you want to buy Kamado Joe Grills in Yorkshire, we have you covered. Featuring a heavy body that’s shaped like an egg, Kamado Joe grills are made from a ceramic material that helps retain heat. Taking inspiration from the earthenware ovens used in China and India for hundreds of years, these grills have been adapted to modern cooking styles. The most prominent feature of any Kamado Joe Grill is the sealed dome construction. This design brings radiant heat and ensures the smoked flavour is evenly distributed. These ceramic grills are extremely versatile, which means you can sear, grill, roast, bake and even smoke. Given their thick exterior, Kamado Joe grills require minimal fuel and can deliver a cook time of up to 14 hours from a single batch of charcoal. Divide and Conquer System – This revolutionary multi-level cooking system allows you to cook different foods in a variety of styles at different temperatures – at the very same time. Featuring a flexible cooking rack, an accessory rack, two halved heat deflectors and a halved cooking grate, this grill makes versatile grilling easy and effortless. Wire Mesh Gasket – Offering an air-tight seal, the wire mesh gasket is the best thing to happen to Kamado Joe grills. What’s more, you can easily replace the gasket. Air Lift Hinge – Ceramic is a fragile material by its very nature. The air lift hinge helps minimise the chance of cracking. This reduces the weight of the dome while preventing the lids of your grill from slamming shut and breaking. Innovative Grill Design – The grill has been designed in a way that simplifies air control. Simply adjust the top and bottom vents to increase or decrease the heat. It’s as simple as that. An Array of Cooking Surfaces – The Kamado Joe cooking surfaces are available in an array of materials including ceramic stone, stainless steel and cast iron. Every material is different when it comes to holding and transferring heat. This means that you can choose a surface that’s right for your cooking needs. Slide-Out Ash Drawer – While you cook, ash gets collected in the ash drawer. When you are done cooking, simply slide the drawer, get the pan out and dump the ash. A cooking rack where you can add coal without lifting the entire gate. A grate gripper that allows you to add charcoal even when the grill is hot. An ash tool for cleaning after you are done cooking. A heat deflector that helps with baking. Classic – The classic range is the original Kamado Joe. This grill boasts all the fascinating features discussed above that offer the best cooking experience. Joe Jr – This is the smallest grill in the collection. This grill features convenient handles, which make it easy to carry this grill anywhere you go. When you are looking for a portable Kamado Joe Grill, this is the one you need. Big Joe – If you are looking for a big grill, then this is the one. This is the most versatile grill out there and if you have the space and budget for it, look no further. Why Choose a Kamado Joe Grill? Superlative Taste – Food cooked in Kamado Joe grills taste better thanks to the ceramic body and the insulation capabilities, which ensure your food retains its natural oils as well as moisture content. This means that your food will be unbelievably tender and juicy. 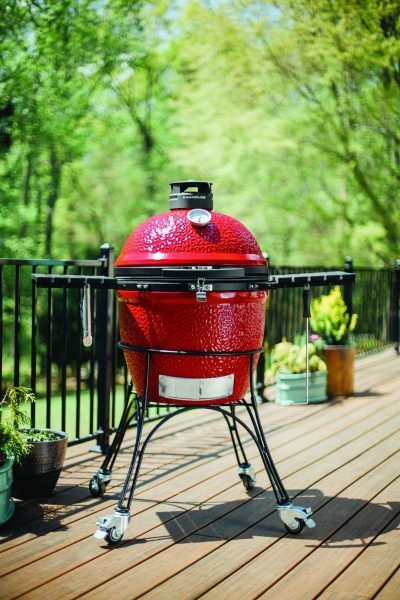 Extremely Durable – The ceramic body of Kamado Joe grills boast a lifetime warranty. Similarly, the use of powder coated 304 stainless steel, 304 stainless steel, finished natural bamboo and powder coated cast iron in the hardware and accents assure you of superior durability. All in all, Kamado Joe grills are built to last and will stand the test of time. Super Fast Cooking – Another wonderful benefit of Kamado Joe grills is that they heat up in 15 minutes flat allowing you to get grilling in no time. As a matter of fact, 15 minutes is the time that a gas grill takes to preheat. Cost-Effective Cooking – Given that a Kamado Joe lasts forever, you won’t have to replace your grill and splurge ever so often. Moreover, the natural lump charcoal used in these grills is inexpensive and extremely pocket-friendly. Kamado Joe grills offer a grilling experience like no other. When you want the best grilling, then you need a Kamado Joe. Visit our store in Collingham for a live demo of one of these beauties. For more information, call 01937 574 379 now.